This park is located in Jiangmen High-Tech Development Zone with Longxi Lake at its northern edge. 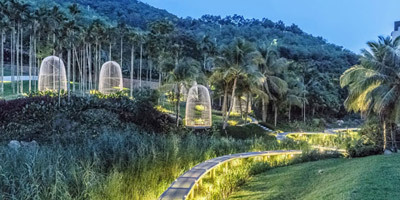 With views to an ecologically rich island resembling the famous ‘Bird Paradise’ in Jiangmen, the design of the landscape has adapted this theme to create a new playscape where ecology and urbanity coexists. Various local cultural elements such as Taishan Diaolou (traditional fortified residences and watch towers in the Ming Dynasty) and the Palmetto Fans of Xinhui were also abstracted into the design to celebrate the cultures of Wuyi. This park has become a new local benchmark for ecological developments in the area with the application of rainwater gardens, permeable paving, and rehabilitation of the river banks. 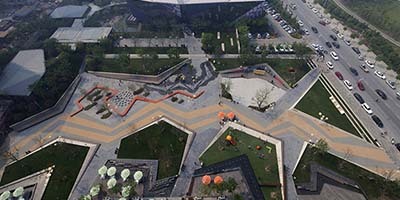 An all age playscape highlighted by an extensive set of slides, a broad sand pit and various shaded feature nest and cage pavilions have helped shape the site into a definitive cultural landmark for the city of Jiangmen.